A news item from Australia told the story of Pascale Honore, a paraplegic woman who, after 18 years of being confined to a wheelchair, has taken up surfing. How? Ty Swan, a young surfer, straps her to his back with duct tape. After getting the balance perfect, Ty paddles out into the ocean so they can catch a wave and Pascale can experience the exhilaration of surfing. This requires a tremendous amount of trust; so many things could go wrong. Yet her confidence in Ty is enough to enable her to enjoy a dream come true, in spite of the danger. Life is like that for the follower of Christ. We live in a dangerous world, filled with unpredictable challenges and unseen perils. Yet, we have joy because we know Someone who is strong enough to carry us through the churning waves of life that threaten to overwhelm us. The psalmist wrote, “Let all those rejoice who put their trust in You; let them ever shout for joy, because You defend them; let those also who love Your name be joyful in You” (Ps. 5:11). In the face of life’s great dangers and challenges, we can know a joy borne out of our trust in God. His strength is more than enough! Our faith is stretched by exchanging our weakness for God’s strength. It's Almost Fall Regional Conference Time! It's almost that time when the members of the North Carolina Region of Alpha Nu Omega, Inc. will come together and enjoy great fellowship in Christ, leadership development, and fun times! 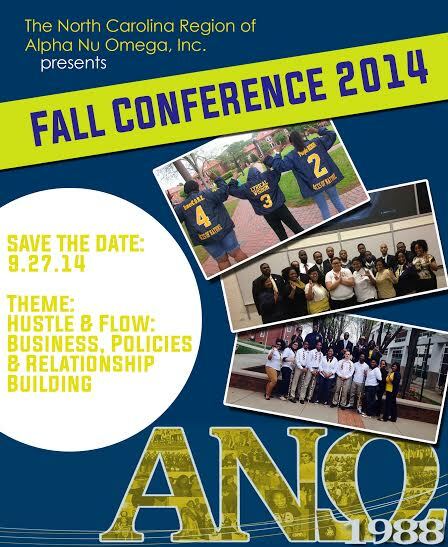 The theme for this fall conference is Hustle & Flow: Business, Policies, and Relationship Building. We are going back to basics, in a sense, but we are also excited about the Lord shifting us to a higher place in this region of Alpha Nu Omega. We have much to do in order to help build up certain chapters within the NC Region, but we are ready to get to work. We pray that this conference will motivate and encourage us as we set out to gain greater membership for our region, take part in community service efforts, and most importantly keep spreading the Gospel of Jesus Christ. ... Greensboro, NC get ready... ANQ is coming on September 27th! Are you interested in learning more about Alpha Nu Omega, Inc? Check out alphanuomega.org. In their book Dear Mrs. Kennedy, Jay Mulvaney and Paul De Angelis note that during the weeks following the assassination of US President John Kennedy, his widow, Jacqueline, received nearly one million letters from people in every part of the world. Some came from heads of state, celebrities, and close friends. Others were sent by ordinary people who addressed them to “Madame Kennedy, Washington” and “Mrs. President, America.” All wrote to express their grief and sympathy for her great loss. When people suffer and we long to help, it’s good to recall Paul’s word-picture of “the God and Father of our Lord Jesus Christ” as “the Father of mercies and God of all comfort” (2 Cor. 1:3). Our heavenly Father is the ultimate source of every tender mercy, kind word, and helpful act that brings encouragement and healing. Bible scholar W. E. Vine says that paraklesis—the Greek word translated “comfort”—means “a calling to one’s side.” The words comfort and consolation appear repeatedly in today’s Bible reading as a reminder that the Lord holds us close and invites us to cling to Him. As the Lord wraps His loving arms around us, we are able to embrace others “with the comfort with which we ourselves are comforted by God” (v.4). to console others as You look out for Your own. God comforts us so that we can comfort others. So often we ask why God allows a hurtful experience to come our way. Today’s reading provides us with at least one very plausible reason for the pain. We are comforted in our afflictions so that we might comfort others in theirs (v.4). Hearing of the faithfulness of God in trials uplifts others who suffer. Molly wanted her dad’s help, but she was afraid to ask. She knew that when he was working on his computer, he didn’t want to be interrupted. He might get upset at me, she thought, so she didn’t ask him. We need not have such fears when we come to Jesus. In Matthew 8:1-4, we read about a leper who didn’t hesitate to interrupt Jesus with his needs. His disease made him desperate—he had been ostracized from society and was in emotional distress. Jesus was busy with “great multitudes,” but the leper made his way through the crowd to talk with Jesus. Matthew’s gospel says that the leper came and “worshiped Him” (v.2). He approached Jesus in worship, with trust in His power, and with humility, acknowledging that the choice to help belonged to Jesus. He said, “Lord, if You are willing, You can make me clean” (v.2). In compassion, Jesus touched him (leprosy had made him “untouchable” by the standards of Jewish law), and he was cleansed immediately. Like the leper, we don’t need to hesitate to approach Jesus with our desire for His help. As we go to Him in humility and worship, we can trust that He will make the best choices for us. What an example this leper is to me, Lord. Give me a heart of worship, of confidence in Your power, and of trust that when I bring my needs to You, You’ll make the best choice. May I surrender to Your will. It's that time again everyone! Get ready for the 2014 Spring NC Regional Conference! Are we all ready for what God wants to do through the ministry of Alpha Nu Omega, Inc.? Are we ready to see how we can make a difference on our college campuses and in the surrounding communities? Are we all on the ship sailing towards making greater impacts on the lives of people whom God has placed in our paths? Then come out to the regional conference! Make checks or money orders payable to: Alpha Nu Omega, Inc.
Believers in Christ don't follow Him today just because He was a great teacher and prophet. Believers don't follow Him because He was crucified. The Romans crucified thousands of people. Believers follow Jesus because He did what no other person did: He died AND rose again in three days for us. It was so we could experience reconciliation with a holy and just God. We deserve the ultimate punishment for our sins: death (separation from God for eternity), but Jesus took the worst punishment in our place as the sacrificed Lamb and made the ultimate atonement for our sins. Jesus didn't come for a political revolution like the Jews in His day thought He would. Jesus came for a spiritual revolution. Jesus came to make dead people live. The question is: Are you really alive? The Son of God Movie Campaign! We are privileged to be invited to take part in the release of a new movie that will have a tremendous impact on the world. On February 28, 2014 the 20th Century Fox movie, Son of God, will be released in theaters nationwide. From the award-winning producers of the record-breaking miniseries The Bible, Roma Downey and Mark Burnett, comes Son of God, the larger-than-life story of The New Testament, to be released by 20th Century Fox on February 28, 2014. Son of God is a major motion picture that brings the life of Jesus Christ to the big screen like never before. Let's help spread the word about this movie in efforts to help the movie to make an even greater impact. As a National organization we will participate in an effort to promote the movie and attend showings during the film’s opening weekend and beyond. Let's see each chapter in our regions make efforts to attend the movie in their respective local theaters on Saturday March 1, 2014! And invite your friends and family to join in! Together we can make an impact and have the great opportunity to share the Gospel of Jesus Christ with someone who needs to hear it.